Cube the baguette into 1/2 inch pieces (should provide around 4 cups of croutons). In a large nonstick pan, fry the bacon over medium-high heat until crispy. Transfer to paper towels to drain. Carefully remove 2 tablespoons of the bacon drippings and set aside, returning the pan to the heat. Add the bread cubes and toss until golden and crispy, stirring regularly, about four minutes. Mix all vinaigrette ingredients in a small bowl and whisk until emulsified. Crumble the bacon. 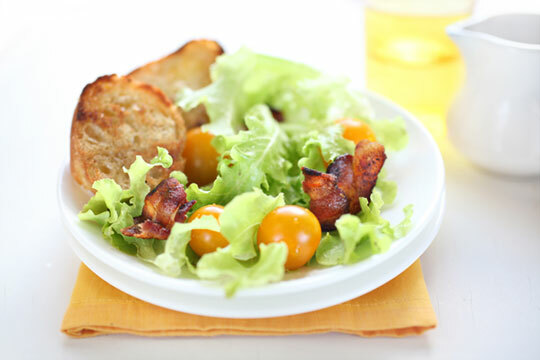 Toss salad ingredients, bacon and croutons, drizzle with dressing and serve. This entry was posted in Healthy Foods, Recipes by admin. Bookmark the permalink.